I never met Peter Jennings, but I always admired his work. Peter's life underscored the truth that reaching the pinnacle of career success is not necessarily equated to time spent in a university classroom. Not only did Peter Jennings not attend college, he never even finished high school. But, goodness, what an education he picked up on the job, in every corner of the world. Fortunately for Peter, he began his career at a time when the big bosses would first consider raw talent, ability, ambition and experience, before even asking about a degree or a diploma. 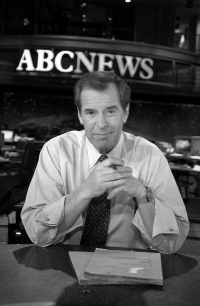 Granted, Peter Jennings had a remarkable gift for communicating and reporting that came to him at an early age. And he was confident enough to follow his instincts. Or, as the late Joseph Campbell would say, he was confident enough to "follow his bliss". His writing was conversational and easy to understand. He instinctively knew the way a story could best be told. He lobbied against the overuse of graphics and banners that often -- for me -- cover too much of the screen during newscasts nowadays. Peter had a knack for putting things into perspective. I suppose it's possible that because he was Canadian -- an outsider -- he could see Americans with a clarity and objectivity beyond our ability to see ourselves. While watching the TV coverage of his death, I heard a recording of a Peter Jennings comment that was very telling. "I lived in the Middle East for a long time, and the one thing I learned after living there was that there is no one absolutely essential truth for all people...... and that every time I look at a coin, I instinctively want to look at the other side." That tells me volumes about the reporter and the man.